Working families have won important victories on a range of workplace rights and consumer protections, including a higher minimum wage, paid leave, and protections against predatory loans – but they are meaningless unless they’re enforced. Traditionally, workers and consumers could file lawsuits to combat corporate wrongdoing, but most of us have lost our right to go to court. 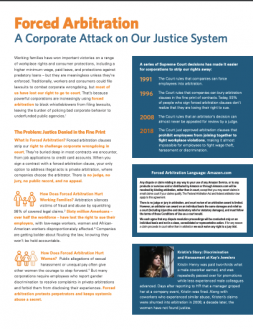 That’s because powerful corporations are increasingly using forced arbitration to block whistleblowers from filing lawsuits, leaving the burden of policing bad corporate behavior to underfunded public agencies.